A Ukrainian woman lights a candle in front of the Russian Embassy in Kyiv to pay tribute to victims of a Russian plane crash in the Sinai Peninsula, Oct. 31, 2015. A Russian passenger plane crashed Saturday in a mountainous part of Egypt's Sinai Peninsula, killing all 224 people on board, including 25 children. The plane disappeared from radar less than half an hour after taking off early Saturday from the resort city of Sharm El-Sheikh. Almost all the passengers were Russian tourists heading home to St. Petersburg. In this image released by the prime minister's office, Sharif Ismail, right, looks at the remains of a crashed passenger jet in Hassana, Egypt, Oct. 31, 2015. Emergency workers had recovered 129 bodies so far, along with both of the plane's black boxes, which record all moments of the flight, including communications involving the pilots. Authorities are hoping the recorders can explain why the plane crashed. 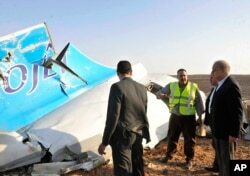 Egyptian Civil Aviation chief Hossam Kamal said that safety checks before the flight did not turn up any problems with the aircraft and that the pilot did not issue an SOS before the plane disappeared. Unconfirmed reports, however, said the pilot reported trouble and asked for the nearest landing site just before controllers lost contact with the Airbus jet. The Islamic State militant group's Egyptian affiliate claimed responsibility for bringing the plane down, although it offered no evidence. Russian Transport Minister Maksim Sokov said the IS claim could not be considered accurate. It is unlikely that IS militants operating in Sinai would have a missile capable of hitting a plane flying that high. The Airbus A-321 had reached cruising altitude of 9,100 meters (more than 29,000 feet) before it went down. Despite the rejection of the militants' claim, two major European airlines — Germany's Lufthansa and Air France — announced they would stop flying over the area for safety reasons. The Airbus had 217 tourists on board, along with seven crew members. Three of the passengers were Ukrainian nationals; all the other victims were Russians. A couple embraces next to a flight information board at Pulkovo airport in St. Petersburg, Oct. 31, 2015. Flowers, memorial candles and toys were piling up outside the arrivals terminal at Pulkovo Airport in St. Petersburg. Doctors and grief counselors were on hand to help the families of the passengers. Russia's President Vladimir Putin declared a national day of mourning Sunday for victims of the crash. From Kyrgyzstan, where he began a tour of Central Asia on Saturday, U.S. Secretary of State John Kerry offered condolences to the families of those who were on board the plane. Ambulances line up as emergency workers unload bodies of victims from the crash of a Russian aircraft over the Sinai peninsula at the Kabrit military airport, some 20 miles north of Suez, Egypt, Oct. 31, 2015. The Metrojet charter flight was operated by the small Russian airline Kogalymavia, also known as Kolavia. It took off from Sharm El-Sheikh at 5:51 a.m. local time (0351 UTC), and disappeared 23 minutes later. Prime Minister Sharif Ismail was in the city of Ismailiya when he learned of the crash. He interrupted his visit for emergency meetings with government and security officials. 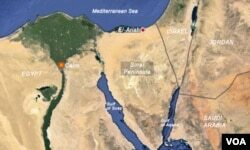 The crash site was about 70 kilometers south of Al-Arish, the largest city in Sinai, on the Mediterranean coast. Egyptian security forces in northern Sinai have been battling a growing Islamic militant insurgency in the area, now led by local affiliates of the Islamic State group, but there have been no incidents involving commercial air traffic. The area where the plane crashed, known as Hassana or Hasna, was the scene of a World War I battle in 1917 between Britain's Imperial Camel Corps and the Turkish army. Ed Yeranian contributed to this report from Cairo. Some information for this report came from AP.